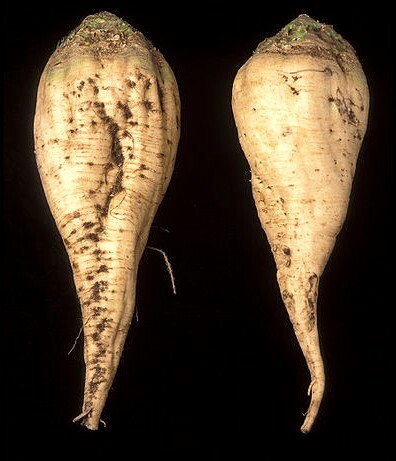 Sugar beet or beetroot plant is a cultivated plant whose root and bulb contains a high concentration of sucrose. Sugar beet belong to Chenopodiaceae family and genus Beta and species vulgaris. There are numerous cultivated varieties of this species including leafy vegetables like chard and spinach beet, root vegetables like sugarbeet and fodder-crops like mangelwurzel. Beet sugar is obtained from this plant and the European Union, Russia and the United States are three largest producers in the world. Plants tolerating tropical and sub-tropical weather have been developed and are being introduced in tropical areas. Though sugar beet was known to man for thousands of years, its history of use in production of sucrose is recent, dating back to 18th century. After harvest, the produce is hauled to processing plants. At the processing plants the produce is washed well and mechanically cut into thin slices (called cossettes). Countercurrent exchange method is employed to extract sugar from the cossettes, and the raw juice is collected in storage tanks. The pulp is pressed in screw presses to extract some more sugary juice. Then the impurities are precipitated and bacterial action is controlled by addition of lime water and passing of carbon dioxide. The supernatant fluid called thin fluid is evaporated to get thick fluid (60% sucrose). Then this fluid is crystallized by an elaborate process to get crystalline beet sugar.